Cape Town - South Africa's Hilton Langenhoven qualified for the men's 400m T12 final at the London Paralympics on Tuesday. Langenhoven finished first in his semi-final heat - and with the second-fastest time overall - ahead of Thursday evening's final. 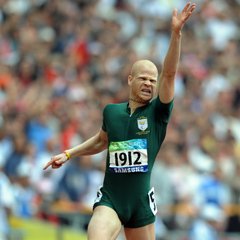 Langenhoven's time of 49.42 was a mere 0.40 seconds outside that of Tunisia's Mahmoud Khaldi (49.02). The final is scheduled for 20:00 SA time. Meanwhile, South Africa's Tshepo Bhebe failed to qualify for the men's 400m T46 category, when he finished 11th out of the 13 entrants.